Sabertooth X79 series included in the ranks TUF (The Ultimate Force) which is intended specifically for highend workstation. With military-style colors, this product favor toughness cooling system. We are interested in the design of this product that it looks solid with a bandage extra cooling on the chipset as well as the rear panel. With names Thermal Armor, this cooler is a comprehensive solution for the system to be able to dispel heat optimally. Cooling is placed on the area of the chipset and I / O ports on the back panel. Not only that, the air is also equipped with Thermal Radar which monitors the temperature of the heat. By default, the fan speed will work according to the recorded temperature. One interesting feature of this product is part of the rear panel is equipped with a BIOS Flashback button. This button is useful to restore a corrupted BIOS. Not only that, you also can use it to try out a new BIOS firmware that is placed on a USB. It did not would disrupt the existing BIOS. 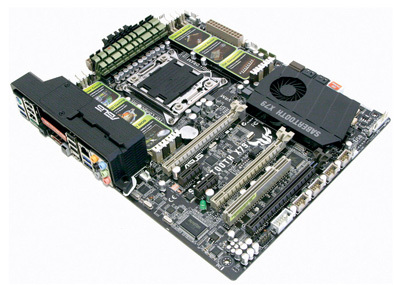 To improve graphics performance, this motherboard comes with three PCI Express x16 slots with bandwidth respectively x18, x16, and x8. Graphics card mode it supports CrossfireX and SLI is. In terms of storage, this product is equipped with 4 SATA3 ports. Interestingly, two SATA3 ports have SSD Caching feature that distinguished the grayish-white color. This feature can be used to get the performance up to 3x faster than normal mode. Two port relies on a separate controller chip is Marvell. To optimally utilize these products, users can use the AI Suite II application. This application contains tools to overclock and perform system configuration through Windows. Unfortunately, as a high-end product at a price that is quite expensive, only available on the bundled accessories simple. With abundant features and cooling solutions and tough durability, Asus Sabertooth X79 is not intended for everyone. This product is suitable for those who want high performance with support for the latest technology. Support cooler were good enough for overclocking activity. SSD Caching feature will optimize the performance of storage so that they can work several times faster. Plus: strong performance, feature rich; Thermal Solutions cooling system, two SATA ports support SSD caching; BIOS flashback button. Minus: Without instant power button, reset, and LED debug; not come with many accessories; expensive.